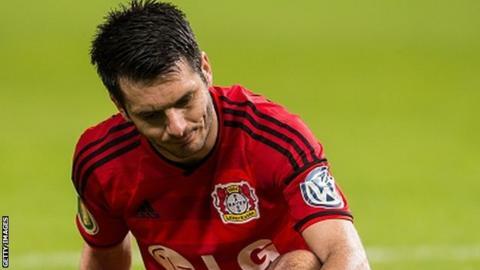 Bayer Leverkusen have released defender Emir Spahic with immediate effect following a fight with security staff after a German Cup defeat. The 34-year-old was filmed fighting with security personnel after the home tie with Bayern Munich on 8 April. Leverkusen managing director Michael Schade said: "The latest revelations from the case last Wednesday leave us no other choice." Spahic told Bayer's website: "I regret my behaviour towards security staff." A Bosnia-Herzegovina international, he joined the club in 2013. Leverkusen said Spahic accepted responsibility for his actions and agreed to the termination of his contract, which was scheduled to run to 2016. Spahic injured his knee in the quarter-final tie and was ruled out for up to four weeks. Bayern Munich advanced to the semi-finals 5-3 on penalties after the tie ended goalless after extra time. Spahic, whose career includes spells at Lokomotiv Moscow in Russia, Montpellier in France and Sevilla in Spain, added: "I apologise to the people concerned and their families for my actions. "I know this has also caused big problems for my club." Bayer Leverkusen are fourth in the Bundesliga table.